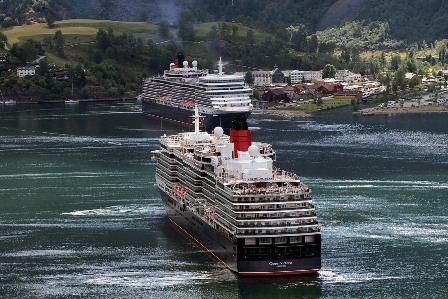 Cunard Line is offering significant savings on select Transatlantic Crossings aboard Queen Mary 2, and European cruises on board Queen Elizabeth and Queen Victoria, for booking by March 31, 2013. In addition, substantial savings on airfare – up to $1000 per couple – are available on select European cruises. The most storied voyage on the seas, Cunard’s Transatlantic Crossing is the only itinerary for which the voyage itself becomes the destination, offering its guests a true escape from the everyday. For more than 170 years, the Line’s Crossings have appealed to a broad range of sophisticated travelers who share a love of glamor, elegance and tradition. On board Queen Mary 2, every day offers a wide variety of engaging opportunities: award-winning enrichment through the Cunard Insights program; well-being in the renowned first Canyon Ranch SpaClub® at sea; and entertainment provided by world-class companies such as the Juilliard Jazz School, the Royal Academy of Dramatic Art and London’s National Symphony Orchestra. Every night is like having “a night out on the town”—cocktails with friends, gourmet cuisine in a different restaurant each evening, ballroom dancing in the Queens Room, or stargazing in the only planetarium at sea. From the magnificent Winter Palace to the Troll Wall, to the Stigfossen Waterfall and the Brandenburg Gate, Europe is home to some of the world’s most celebrated landmarks and destinations. On voyages to the region of 12 days or more, such as the popular St. Petersburg & Baltic Explorer aboard Queen Victoria and Queen Elizabeth, guests will receive up to $1,000 in savings on airfare per couple when flights are booked via the Cunard CompleteAir® programme either through a Travel Agent or by calling Cunard directly. Guests can take advantage of Queen Elizabeth‘s fly-cruise Mediterranean programme by opting to extend their stay in Athens, Rome or Venice up to two days before or after their voyage calls there, allowing for added discovery and adventure in port at one’s leisure. Additionally, guests booking a Britannia Club on the Queen Elizabeth‘s May 26 2013 Norwegian Fjords & North Cape Explorer can save up to $1,200 per stateroom in cruise fare. Queen Elizabeth’s grand art deco interiors and unique art works, which pay homage to both the original Queen Elizabeth and Great Britain’s Royal Family, continue to fascinate and delight guests who sail aboard the Line’s newest Cunarder. The ship’s Grand Lobby prominently displays the 18.5 ft. marquetry piece of the original Queen Elizabeth created by David Linley, only nephew of Her Majesty The Queen; and a specially commissioned portrait of The Queen, created by artist Isobel Peachey particularly for the 2010 debut of Queen Elizabeth. In grand Cunard tradition, Queen Victoria is designed in the spirit of the floating palaces of the past. Having debuted in December 2007, she captured the world stage in a way few ships ever do – becoming one of the most fêted ships to be introduced in recent years and quickly establishing herself in the Cunard fleet. Every inch of the 2,000-passenger liner is infused with a sense of luxury and tradition – from the Royal Court Theatre, which includes the first private viewing boxes at sea, to the signature two-storey library with a spiral staircase and nearly 6,000 volumes. Queen Victoria features double- and triple-height public rooms that evoke the rich and well-recorded history of ocean liner and Victorian era design. Fares are available on a space-available basis at time of reservation. Fares for other categories not shown and for other voyages may vary. Fares are per person, do not include air travel, are voyage only, are based on double occupancy and apply to the first two guests in a stateroom. The offer expires March 31,2013. For more information about Queen Mary 2, Queen Victoria or Queen Elizabeth, or to book a voyage, consult your Travel Agent, call Cunard toll-free at 1-800-728-6273 or go to www.cunard.com. On 16 August, Cunard Line launches their five-day Extraordinary Adventures Event Sale, featuring exotic World Voyage Segments in Asia, Australia and the Middle East on both Queen Mary 2 and Queen Victoria. The sale also includes Transatlantic Crossings and a Panama Canal transit. The special sale offers significant savings of up to 45 percent off Early Booking Fares in addition to On Board Credit of up to $300 per stateroom, plus a Reduced Deposit on select 2013 voyages. All cruise prices are per person, based on double occupancy. Offer is for new bookings only. The sale runs through 20 August. Guests sailing a luxury cruise vacation aboard Cunard Line delight in the experience of the voyage itself, not just the destination. By day, guests enjoy voluminous libraries, world class spas, white-gloved afternoon tea service and engaging award-winning Insights guest enrichment programs; and by night are entertained by Royal Nights themed balls, West End-style productions and Veuve Clicquot champagne cocktails. For more information about Queen Mary 2 or Queen Victoria, or to book a voyage, consult your travel agent, call Cunard toll-free 1-800-728-6273 or go to www.cunard.com. 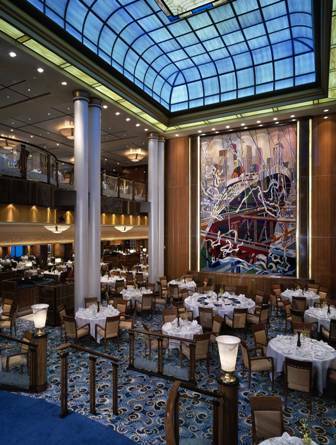 The elegantly-appointed Britannia Restaurant aboard Queen Mary 2. Cunard Line’s flagship Queen Mary 2, renowned for her signature trans-Atlantic Cruise, has been named “Best Luxury Cruise Ship” for the eighth consecutive year by the readers of Travel Weekly, the national publication of the travel industry. The award signifies the ocean liner’s dominance in providing the ultimate luxury cruise for which Cunard is known. Bestowed at the magazine’s ninth annual Readers Choice Awards gala event, held on 15 December 2011 at The Plaza Hotel in New York City, the awards are presented annually to industry suppliers who set the highest standard for product and service during the past year. Recently, Queen Mary 2 completed a significant 14-day refurbishment of all 1,310 staterooms, the Canyon Ranch SpaClub, the Queens Grill and Princess Grill Suites and Restaurants, the Commodore Club, the Veuve Clicquot Champagne Bar, Sir Samuel’s Bar and Lounge, and the children’s Play Zone. The Golden Lion Pub also received a complete redesign, including upgraded flat screen televisions. In 2012, Queen Mary 2 will depart on her fifth World Voyage, continuing the Line’s rich tradition of offering legendary and exotic itineraries. Queen Mary 2 will sail roundtrip from Southampton on a unique 108-day cruise which will include a maiden call to the spectacular sand dunes in Namibia’s Swakopmund before a two-night stay in Cape Town. She will then resume her iconic trans-Atlantic Crossings, sailing 20 of these legendary voyages in 2012, including six nine-day extended trans-Atlantic cruises between New York and Hamburg. Queen Mary 2 is one of the grandest ocean liners ever built and offers many distinctive features which is why she has deserved to be called the “Best Luxury Cruise Ship.” Along with Cunard’s impeccable White Star Service, guests revel in the luxury of time as they enjoy myriad amenities on board – including the largest library at sea, the only planetarium at sea, the first Todd English Restaurant at sea, and the first Canyon Ranch SpaClub aboard a ship, as well as the largest ballroom at sea where guests get decked out for glamorous evenings at Royal Nights Themed Balls. In addition, renowned guests and speakers present intellectually rewarding lectures as part of the award-winning Cunard Insights enrichment program, from NASA astronaut Dr. Jeffrey Hoffman to former CNN correspondent and novelist Kitty Pilgrim. Intimate luxury on a grand scale is the experience that awaits in the famed Queens Grill and Princess Grill Suites, where guests are pampered with the finest service and amenities, priority embarkation, a dedicated concierge, and exquisite cuisine in exclusive and elegantly appointed single-seating dining rooms. 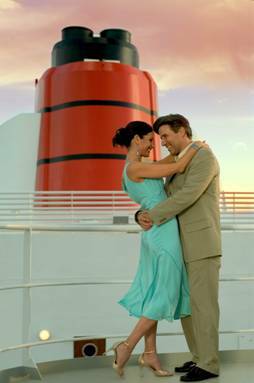 For more information about Queen Mary 2 and to book a voyage, consult your travel professional, call toll-free 1-800-728-6273 or go to www.cunard.com.